Joel Roberts Ninde was a self-taught architect in Fort Wayne. Her first design was the house that she and her husband, Lee J. Ninde, lived in. She refused to live in his family home due to the dark and drafty rooms, and they could not find a home that was “small, convenient, comfortable, attractive, and inexpensive”. The residential package that she created was a success and, as a result, she and her husband formed a real estate and construction firm in 1910 called Wildwood Builders Company. Joel Roberts Ninde and her business partner, Grace Crosby, were the designers and construction supervisors for the company while Lee Ninde focused on promotion and real estate. 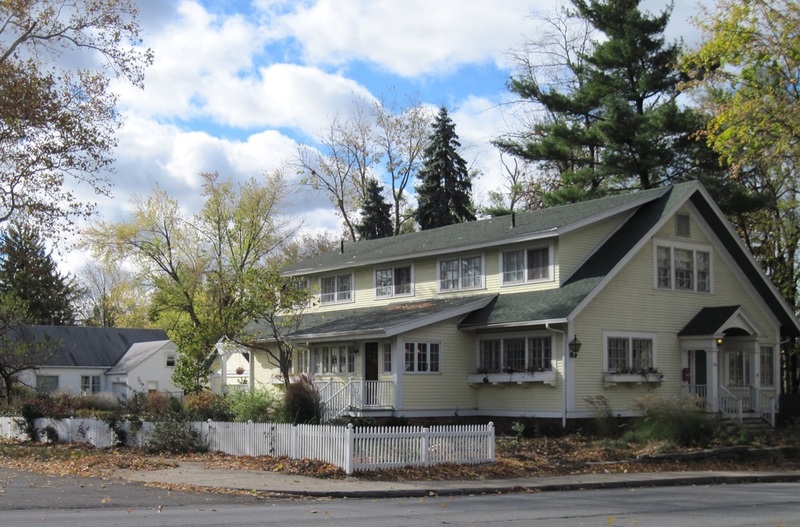 Wildwood Builders created houses in the Colonial Revival and Craftsman styles with innovative features that appealed to housewives. Ninde’s designs were called “pleasing to the eye, economical, convenient, and efficient” and she consequently became one of the most popular architects of the time in Fort Wayne. By 1914, she had designed over 300 houses ranging from small cottages to more substantial brick homes. In combination with residential architecture, the Wildwood Builders Company also stressed city planning. Prior to the early suburban developments they created, planning in Fort Wayne followed the city grid plan with narrow lots and straight streets. However, the Nindes wanted their neighborhoods to take advantage of the natural features. Houses were placed on larger lots and the roads would curve to follow the topography which not only made the area more picturesque but would discourage speeding. Wildwood developments left established trees in place and created numerous gardens. They also included new infrastructure that had not been considered previously including individual water supply and a “double sewage” system. Between 1913 and 1917, the Wildwood Company also produced Wildwood Magazine. This nationally known periodical included topics related to architecture, city planning, and interior design. Joel Roberts Ninde died from a stroke in 1916 at the age of 42. The Wildwood Builders continued to design homes and develop residential neighborhoods into the late 1920s. The work of the Wildwood Builders can be found in a variety of areas around Fort Wayne including the South Wayne Historic District, Shawnee Place, Wildwood Park, and Wildwood Place. Indiana Division of Historic Preservation and Archaeology, “Joel Roberts Ninde House,” Discover Indiana, accessed April 25, 2019, https://publichistory.iupui.edu/items/show/349.